All price ranges and communities have available rental inventory. With distressed prices, owners don’t want to sell, and with potential buyers with credit blemishes or homes to sell in other cities, rentals are in demand. DenverRental.com, a newly launched website and the namesake of metro Denver’s premier full-service property management and leasing assistance company, provides a single, one-stop source for rental property owners seeking highly qualified tenants and professional management services. 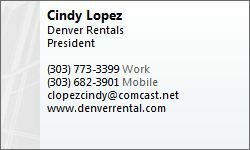 DenverRental.com will navigate owners through the complexities inherent to rental properties while providing top-quality professional management in all aspects of the process, including marketing, tenant selection, lease preparation, income reporting and much more. This entry was posted in Denver, Denver Housing, Denver Residential Real Estate. Bookmark the permalink.